Rain impact splash effects appear on most uncovered surfaces during rain. Ambient, rain sound effects play in interiors with keyword LocTypeDwelling. The MCM should now be properly updated. Splash levels converted to three levels: light, medium and heavy. Light and medium were levels 2 and 4 from previous versions. Heavy is a new level, which would have been level 6 under the previous version's naming scheme. This change results in a more significant difference between levels while at the same time adding a higher level, which has been heavily requested. It is recommended that you go into your settings to set your options again. Reduced mod memory usage during rain. Fixed the issue with the mod disabling itself. Special thanks to roumensp for testing. Increased splash amount and transparency. Added variations under Optional Files for more opaque or transparent splashes. 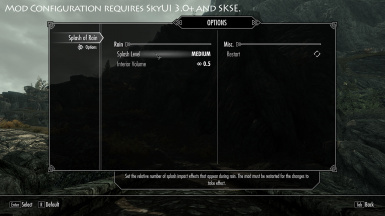 MCM options added for splash amount and interior rain volume. Switch interior detection keyword to LocTypeDwelling to increase the number of buildings affected by the ambient rain audio. Hopefully fixed an issue with the mod disabling itself. Splash effects can now play on rocks. Disabled splash effects while swimming.